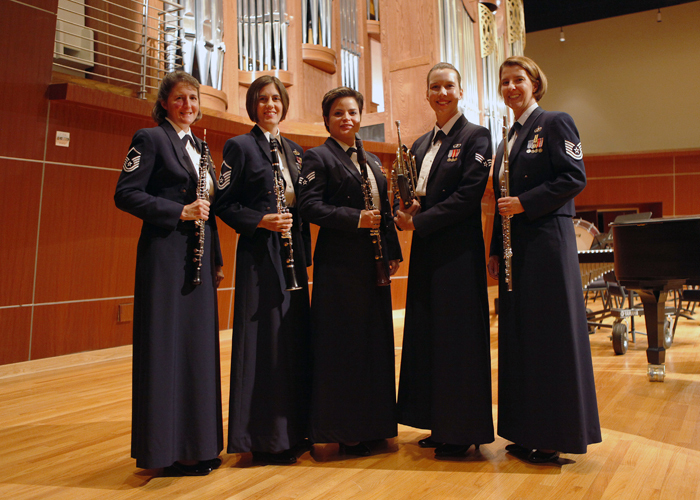 Southwest Winds, from the United States Air Force Band of the West will be presenting a concert at Coastal Bend College Gertrude R. Jones Fine Arts Auditorium on 25 March 2012, at 3 p.m. This concert is free and open to the public. Southwest Winds, a component of the United States Air Force Band of the West, brings the highest standards of musical excellence to its audiences. Fashioned after a typical orchestral wind section and comprised of eight world-class instrumentalists, Southwest Winds promotes the concept of using classical chamber ensembles in musical support of Air Force recruiting and retention, troop morale, and community relations missions. The inherent versatility of Southwest Winds enables it to perform a wide variety of music, from Mozart and Beethoven to contemporary jazz, popular music, marches and patriotic favorites. Capitalizing on this versatility, Southwest Winds provides entertainment at a multitude of venues to include official military ceremonies and functions, educational outreach at elementary and junior high schools, recruiting concerts at high schools and college campuses, and community relations concerts. As part of the Air Education and Training Command at Lackland Air Force Base, Texas, Southwest Winds is proud to represent the men and women of the United States Air Force. Combining pride in the Air Force story with their love of music and education, Southwest Winds brings a uniquely motivating experience to military and civilian audiences throughout Texas, Arizona, Louisiana, and New Mexico. This event is sponsored by Coastal Bend College. For more information, please visit the Band of the West at www.bandofthewest.af.mil, or on Facebook at www.facebook.com/bandofthewest.